2 Module 1 – Circle 6 What is Risalah? 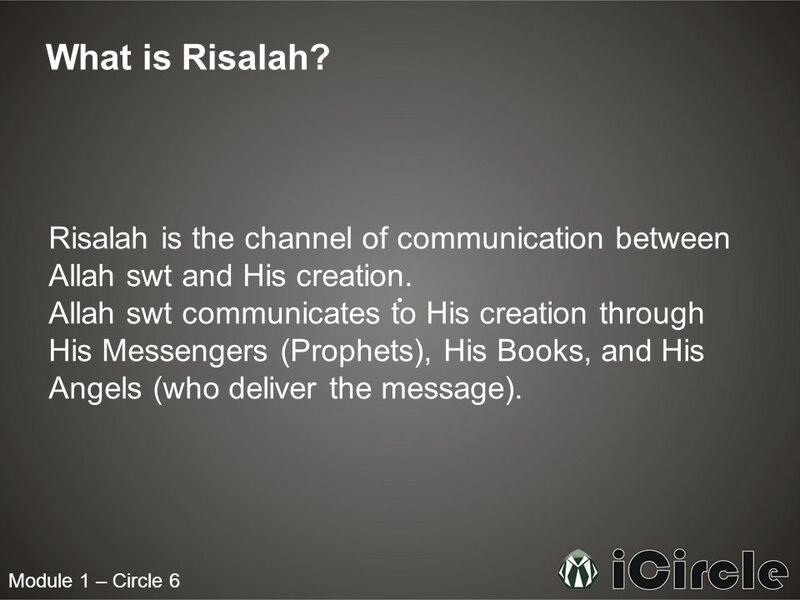 Risalah is the channel of communication between Allah swt and His creation. Allah swt communicates to His creation through His Messengers (Prophets), His Books, and His Angels (who deliver the message). 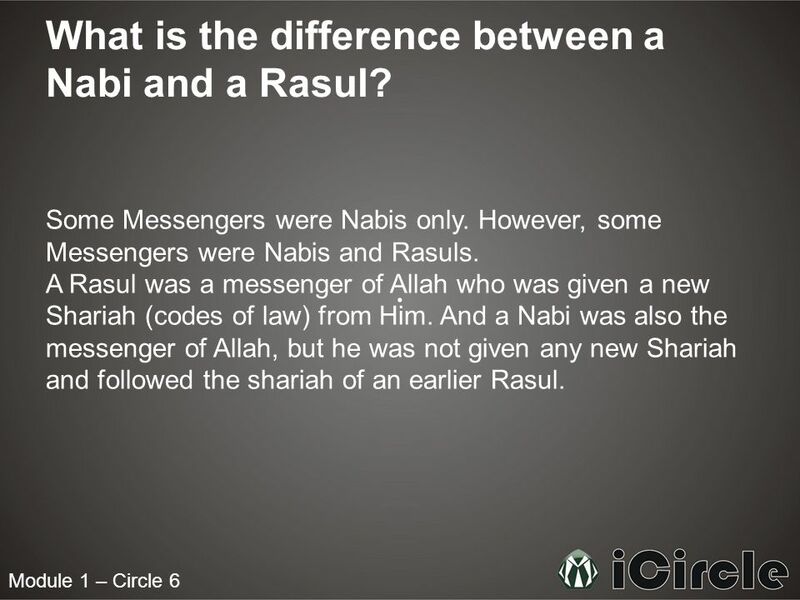 7 Module 1 – Circle 6 What is the difference between a Nabi and a Rasul? Some Messengers were Nabis only. However, some Messengers were Nabis and Rasuls. A Rasul was a messenger of Allah who was given a new Shariah (codes of law) from Him. And a Nabi was also the messenger of Allah, but he was not given any new Shariah and followed the shariah of an earlier Rasul. 8 Module 1 – Circle 6 How many Rasuls were there? 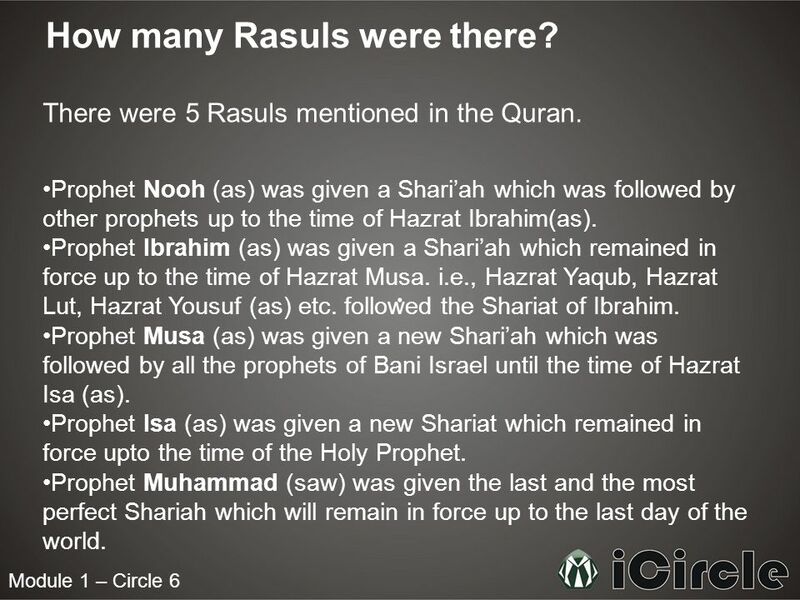 There were 5 Rasuls mentioned in the Quran. 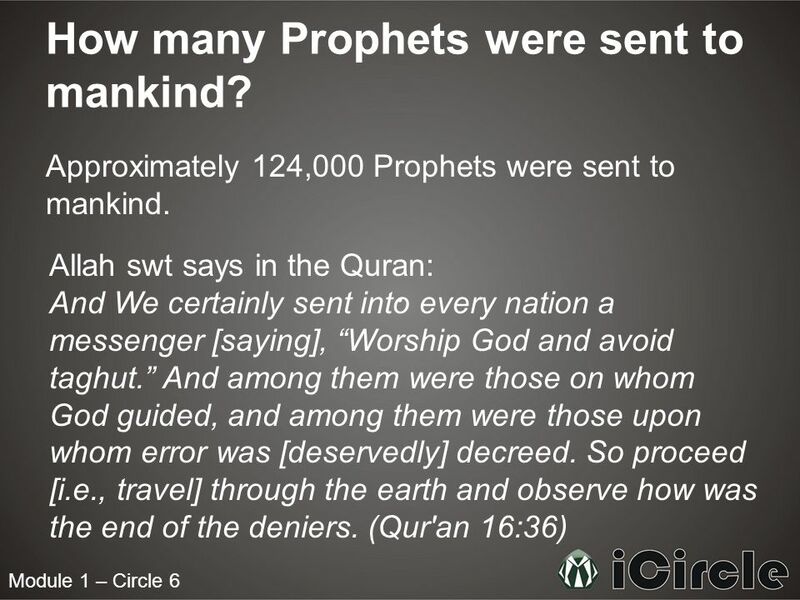 Prophet Nooh (as) was given a Shariah which was followed by other prophets up to the time of Hazrat Ibrahim(as). Prophet Ibrahim (as) was given a Shariah which remained in force up to the time of Hazrat Musa. i.e., Hazrat Yaqub, Hazrat Lut, Hazrat Yousuf (as) etc. followed the Shariat of Ibrahim. Prophet Musa (as) was given a new Shariah which was followed by all the prophets of Bani Israel until the time of Hazrat Isa (as). Prophet Isa (as) was given a new Shariat which remained in force upto the time of the Holy Prophet. Prophet Muhammad (saw) was given the last and the most perfect Shariah which will remain in force up to the last day of the world. 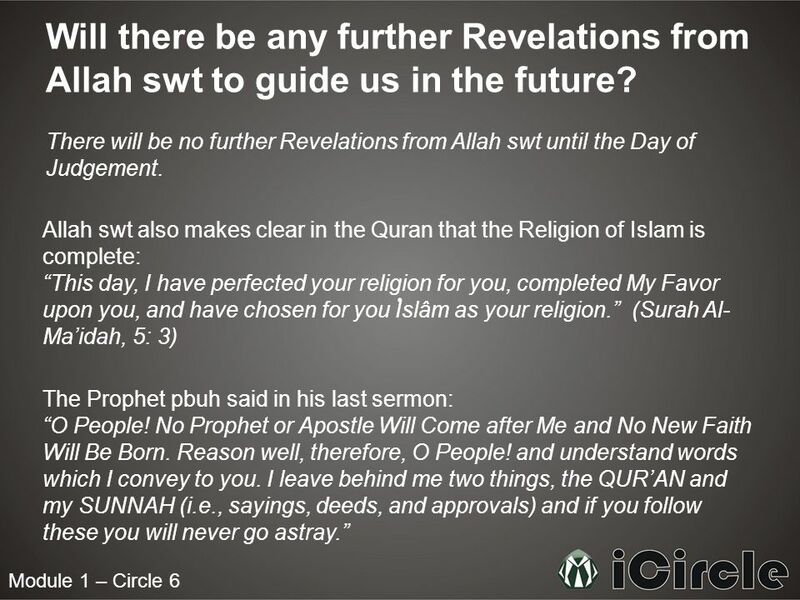 10 Module 1 – Circle 6 Should Muslims still follow the Revelations prior to the Quran? Only the Quran exists in its original form, unchanged. The other divine books are not available in their original language and form. Even their original texts do not exist. The Zabur, Tawrat and lnjil were compiled by their followers many years after the death of the prophets to whom they were revealed. Their compilers have modified, changed and distorted Allah's words. They mixed their words with Allah's words. 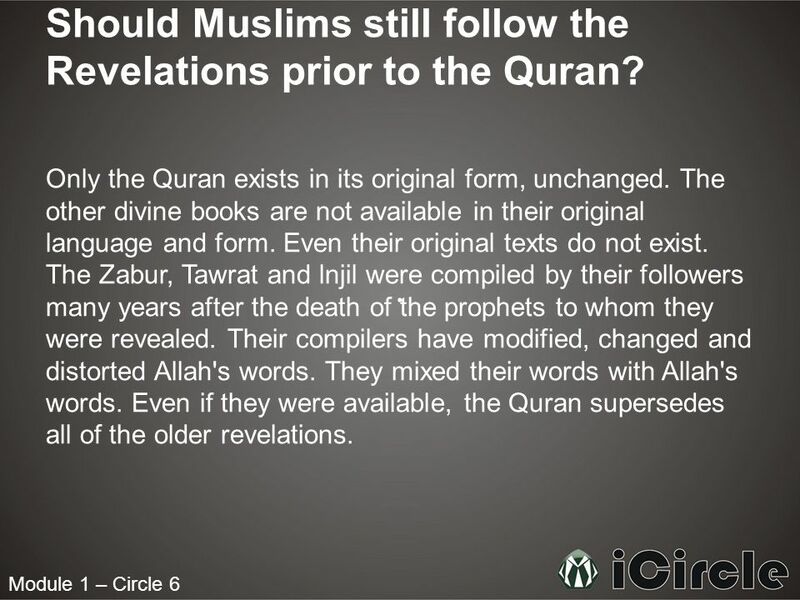 Even if they were available, the Quran supersedes all of the older revelations. 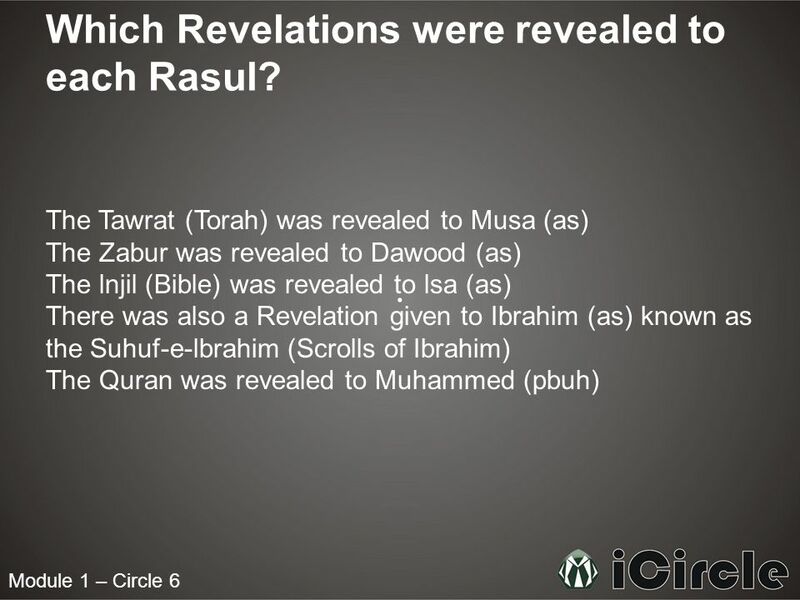 11 Module 1 – Circle 6 How does a Rasul receive Revelation? 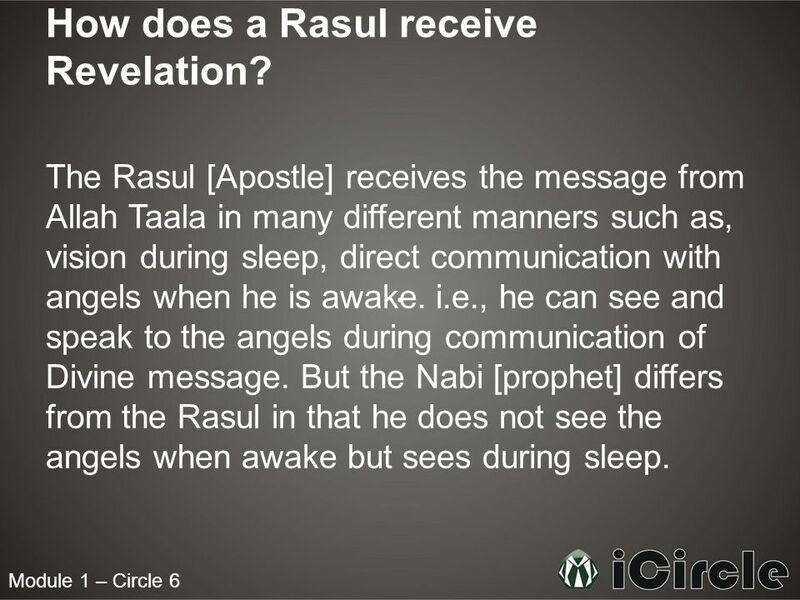 The Rasul [Apostle] receives the message from Allah Taala in many different manners such as, vision during sleep, direct communication with angels when he is awake. i.e., he can see and speak to the angels during communication of Divine message. But the Nabi [prophet] differs from the Rasul in that he does not see the angels when awake but sees during sleep. 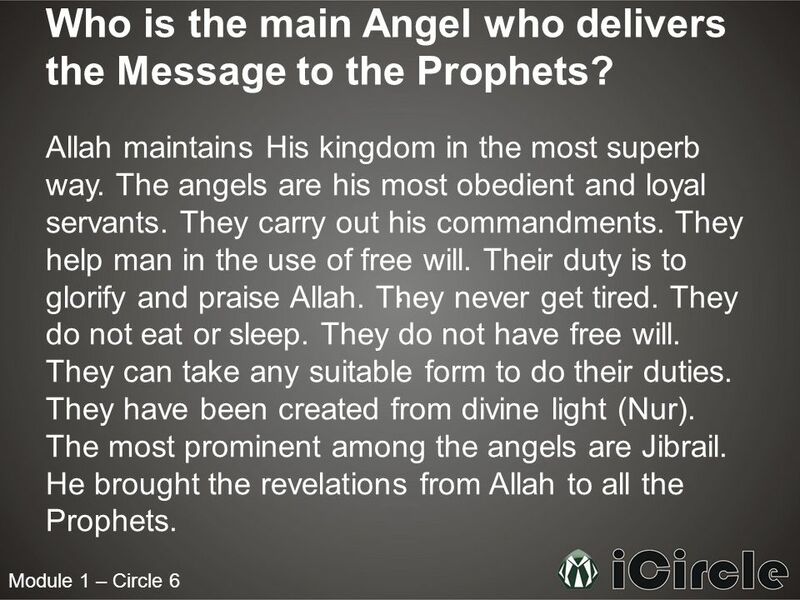 12 Module 1 – Circle 6 Who is the main Angel who delivers the Message to the Prophets? Allah maintains His kingdom in the most superb way. The angels are his most obedient and loyal servants. They carry out his commandments. They help man in the use of free will. Their duty is to glorify and praise Allah. They never get tired. They do not eat or sleep. They do not have free will. They can take any suitable form to do their duties. They have been created from divine light (Nur). The most prominent among the angels are Jibrail. He brought the revelations from Allah to all the Prophets. 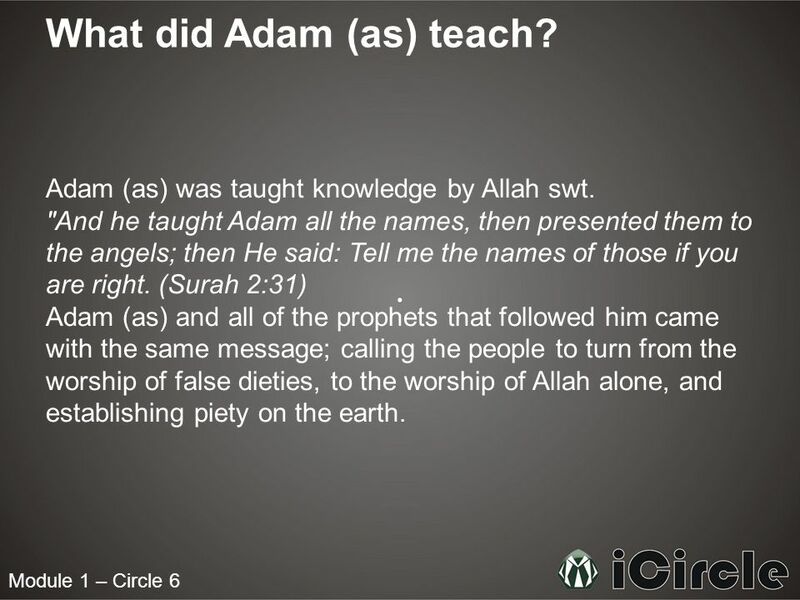 14 Module 1 – Circle 6 Will there be any further Revelations from Allah swt to guide us in the future? There will be no further Revelations from Allah swt until the Day of Judgement. Allah swt also makes clear in the Quran that the Religion of Islam is complete: This day, I have perfected your religion for you, completed My Favor upon you, and have chosen for you Islâm as your religion. (Surah Al- Maidah, 5: 3) The Prophet pbuh said in his last sermon: O People! No Prophet or Apostle Will Come after Me and No New Faith Will Be Born. Reason well, therefore, O People! and understand words which I convey to you. I leave behind me two things, the QURAN and my SUNNAH (i.e., sayings, deeds, and approvals) and if you follow these you will never go astray. 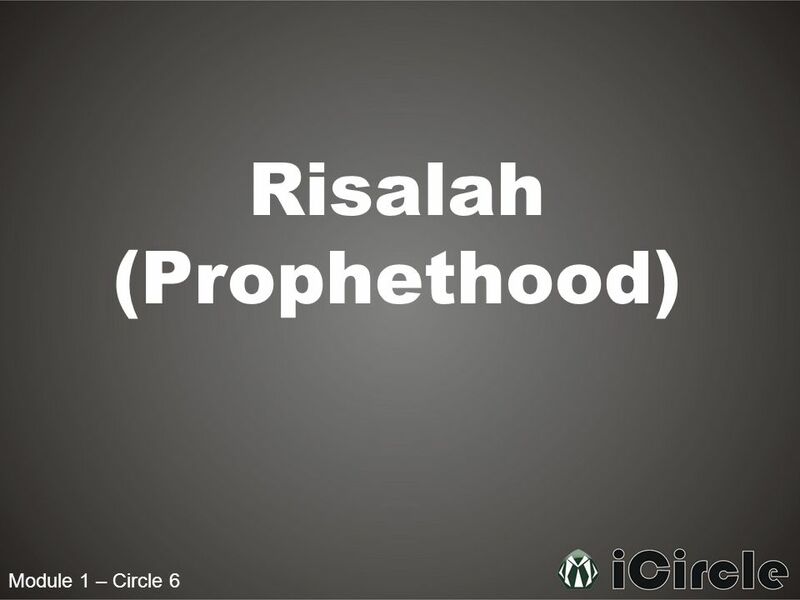 Download ppt "Module 1 – Circle 6 Risalah (Prophethood). Module 1 – Circle 6 What is Risalah? Risalah is the channel of communication between Allah swt and His creation." 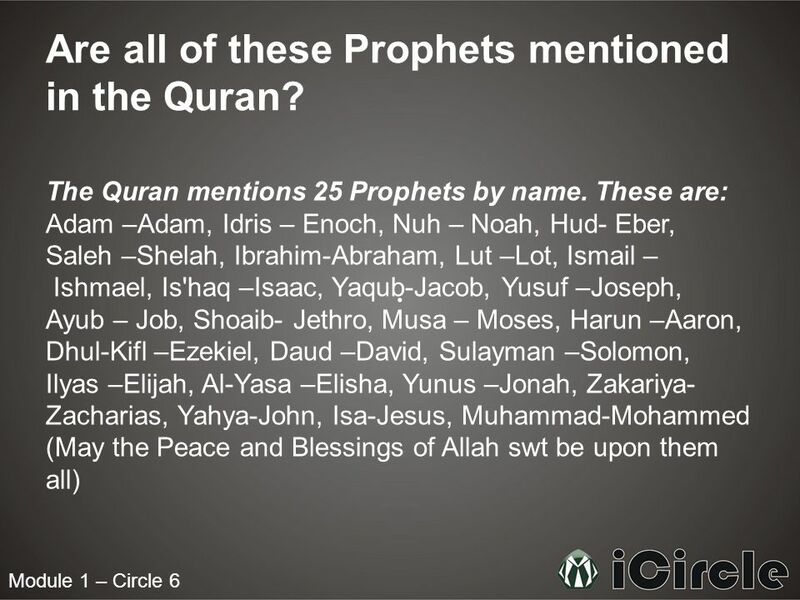 Surah Al An’am Allah’s relation with His Prophets. Part I 40 Questions Questions about Iman. Click for the answer Questions, Iman, batch #12 Why do you call yourself a Muslim? a.Because I believe in Allah. ALI 138: Tafseer of Sura Saba Session Four __________________________________________ Questions for Tadabbur : Verses ) List the favors given. October 09, 2011 Intermediate Religion By:Sarah Kassim Modified By: Ali Yasein and Hasan Kassim A JOURNEY OF OUR ISLAMIC BELIEFS. Conditions Of Shahada Lailallah illaallah 1 st declaration of faith means there is nothing truly deserving worship besides Allah Lailallah illaallah. Peace through submission to Allah My Little Reference Book. Messengers of Allah 1.Allah sent many messengers to this world from time to time to guide mankind. 2.These messengers were known as RASOOLS and NABIS. Understanding Islam. What is Islam? According to Muslims“The religion of Islam is the acceptance of and obedience to the teachings of God which He revealed. Islam in Brief By: Mohammed A. Al-Abdulhay Petroleum Engineer-Saudi Aramco. Core Muslim Beliefs SCTR 19 – “Religions of the Book” Prepared by Matt Pham. What Muslims Believe Aim: To know what the key beliefs of Islam are and to understand why they are important. Practice of Islam (Deen) „The pillars of Islam“ Shahada – Confession of faith „There is no God but God, and Muhammad is the Apostel of God“ Salat – five.